Official 2010-11 Portugal World Cup Away football shirt manufactured by Nike. Available sizes are small boys, medium boys, large boys, extra large boys and adult sizes S, M, L, XL, XXL. Brand new official football kit of the Portuguese national football team for the 2010 World Cup Finals. 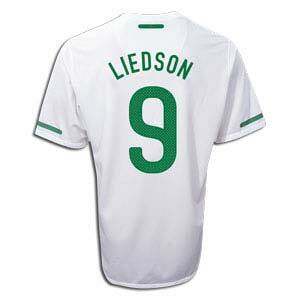 Buy the Portugal soccer jersey with shirt printing of Liedson.